HARTFORD, CT – Ken Gernander had been all through the routine nearly 13 years ago, but that didn’t make it any easier. In fact, in some ways, it was harder. Gernander missed the first two games in his four-year Hartford Wolf Pack/Connecticut Whale head coaching career last week because of blood clots in his legs and lungs. The only trade that the Rangers have pulled off today was one to bring a player to Hartford. John Mitchell, a 26 year old center that plays for Toronto has been dealt for a 7th round draft pick. His role is to pick up where Tim Kennedy left off. One ex-Pack Captain gone (Dane Byers) from Springfield another comes in (Greg Moore). 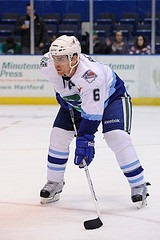 Moore was traded to Columbus for along with Michael Chaput for Tom Sestito. Other Whale news has Kris Newbury, Ryan McDonagh and Mats Zuccarello paperwork filed for their return to Connecticut. That’s just a formality so they can be on the clear day roster and play in the AHL playoffs. John Paddock, who guided the Wolf Pack to their only Calder Cup in 2000, got an unexpected request Monday night to become the new interim coach of the Adirondack Phantoms, the top affiliate of the Philadelphia Flyers. Paddock, the Flyers assistant general manager who was inducted into the AHL Hall of Fame on Jan. 19, wasn’t prepared to replace the fired Greg Gilbert, who lasted only 13 games as the Phantoms got off to the AHL’s worst start (2-10-1-0). The Phantoms have lost nine in a row since a 3-2 victory over Syracuse on Oct. 15. But taking over for Gilbert, who was 32-41-3-4 last season after going 123-89-10-18 in the previous three seasons as Marlies coach, was the best option for the Flyers. Paddock, 56, a former coach and general manager of the Winnipeg Jets and Phoenix Coyotes, coached the Phantoms to a 43-30-2-5 record in the 2008-09 season, the last they were based in Philadelphia. The Phantoms qualified for the playoffs but lost to the Hershey Bears in the first round in four games. He was promoted to Flyers assistant GM the following season. Paddock has won five Calder Cups – two as player (Maine Mariners, 1978 and 1979) and three as a coach (Maine, 1984; Hershey Bears, 1988; Wolf Pack, 2000). He’s the only coach to lead three teams to the league title and had a 130-74-25-11 record in three seasons coaching the Wolf Pack. Paddock has a career record of 585-424-98 over 15 seasons as a head coach in the AHL, with the 585 wins and 1,107 games coached both ranking third in league history. He also had a 142-161-43 record in 346 NHL games with the Jets (1991-92 to 1994-95) and Ottawa Senators (2007-08). Paddock’s assistant could be former New Haven Nighthawks player and Beast of New Haven assistant coach Joe Paterson. “That’s a possibility, but it hasn’t been finalized,” Paddock said. The Phantoms play their first game under Paddock on Thursday night at 7 at home against the Toronto Marlies. Paddock’s first trip back to Hartford will be Nov. 28, when the rebranded Wolf Pack plays its second game as the Connecticut Whale at 5 p.m.
Paddock’s return was scheduled to be for the Wolf Pack’s final home game Saturday night, when the All-Wolf Pack Team will be announced. But that changed when he had to go back behind the bench. Instead of being in Hartford, Paddock will be coaching the Phantoms at home against Abbottsford. He’ll be at the XL Center 15 days later. “That’s the end of a bad trip for us,” Paddock said, referring to four games in five nights, capped by road games at Hershey and Hartford. This season is the New York Rangers’ 85th anniversary season, and in honor of that milestone, the team is unveiling Heritage Week, a weeklong schedule of activities and programming from Friday through Nov. 17 that will provide fans with many opportunities to help celebrate the team’s history. The celebration begins Friday, when the Rangers unveil a new third jersey that the team will wear during select regular-season games. The jersey is a contemporized throwback that will pay homage to Rangers’ rich history and iconic alumni. A special version of the jersey featuring unique embellishments will be available only at Madison Square Garden. Also on Friday, there will two grand launch events at the Rink at Rockefeller Center and the NHL Powered by Reebok store on Sixth Avenue. Both events will feature top current Rangers players and alumni, including Hockey Hall of Famer and Cheshire native Brian Leetch, former Whalers enforcer Nick Fotiu, Eddie Giacomin, Adam Graves, Ron Duguay, Vic Hadfield, Brian Mullen, Gilles Villemure and Pete Stemkowski. The event at Rockefeller Center will feature the unveiling of the third jersey at 7 p.m., followed by a free public skate for fans from 8 p.m. to midnight. At the same time, the NHL Store will offer Rangers fans the opportunity to be the first to don the new jersey from 6 to 10 p.m. The lucky customer who makes the first purchase of the anniversary jersey will win a package that includes tickets to the home game against the Boston Bruins on Nov. 17, when the Rangers will skate in their heritage jerseys for the first time. Rangers past and present will visit the NHL Store throughout the night, stepping into the radio booth for interviews for Sirius/XM’s NHL Live! show. Fans will have the opportunity to submit questions for the radio interviews and win raffle prizes and giveaways. On Saturday, Rangers partner community rinks will host free public skating sessions to celebrate the anniversary. The sessions will feature appearances by Rangers alumni, raffles and fan giveaways at Floyd Hall Arena, 1:15-3:15 p.m. with Duguay; Danbury Arena, 1:30-2:30 p.m. with Hadfield; Brewster Arena, 3:30-4:30 p.m. with Hadfield; World Ice Arena, noon-1:30 p.m. with Giacomin; Staten Island Skating Pavilion, 2:30-4:30 p.m. with Fotiu; and Stergiopoulos Rink, 2:30-4:30 p.m. with Giacomin. Throughout the week, Rangers fans will be treated to a special Hockey Hall of Fame exhibit located at the mall area in front of MSG. Featured items will include Conn Smyth, Norris, Calder and Vezina Trophies, game-used equipment from Rangers greats, as well as a one-of-a-kind display area highlighting the evolution of the Rangers jersey ranging from the original 1926 jersey to the 85th anniversary heritage jersey. The All-Time Wolf Pack Team, selected by a vote of the fans, will be announced Saturday night before a game against the Springfield Falcons, the last for the Wolf Pack at the XL Center. The first 3,000 fans will receive a free Wolf Pack commemorative poster, and there will be video highlights of the 13-plus years of the team, which will be re-branded as the Connecticut Whale on Nov. 27 against the Sound Tigers. Fans voted for one goalie, two defensemen and three forwards. The candidates were goaltenders Jason LaBarbera, J.F. Labbe and Steve Valiquette, defensemen Dan Girardi, Mike Mottau, Thomas Pock, Corey Potter, Dale Purinton and Terry Virtue and forwards Ken Gernander, Dane Byers, Derek Armstrong, Nigel Dawes, Alex Giroux, Todd Hall, Greg Moore, P.A. Parenteau, Richard Scott, Brad Smyth, P.J. Stock and Craig Weller. The Wolf Pack will host their annual Bowl-a-Thon on Sunday at the AMF Silver Lanes, 748 Silver Lane, East Hartford. There will be sessions at 11 a.m. and 2 p.m.
All Wolf Pack players will be bowling with teams of four bowlers, who have collected pledges to benefit Special Olympics Connecticut Eastern Region. A minimum pledge of $200 is required for a team to enter, and the top fund-raising teams will win prizes, including the use of luxury suites at Wolf Pack home games. Register online at www.soct.org. For more information, call 877-660-6667. Last year’s Wolf Pack captain Greg Moore was traded from the Sound Tigers to the Columbus Blue Jackets for ex-Pack d-man Dylan Reese. TSN.ca has Moore…pardon the pun. In the last two games the Hartford Wolf Pack have given up a total of thirteen goals. 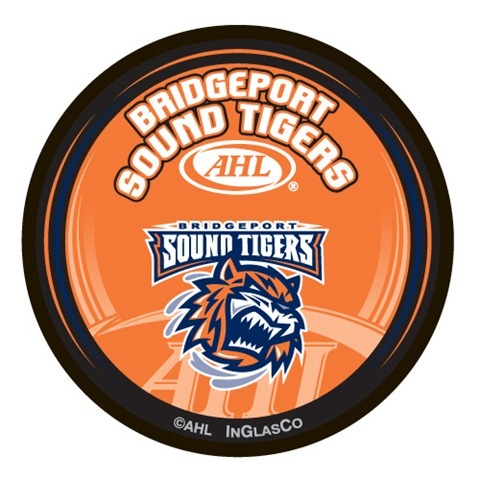 They lost 7-1 to Providence on Friday and dropped a 6-4 decision to in-state and franchise rivals the Bridgeport Sound Tigers at the XL Center Saturday night. In the last ten games, the New York Rangers’ top farm team has only been able to taste victory twice going 2-6-2-0 over that span. As bad as that seems on the surface, this team continues to compete but it’s a team that just doesn’t have the level of talent to compete for a Atlantic Division Title, let alone a Calder Cup. They say a team wins from the net out. In the last two games, the Pack have not seen the kind of goaltending they need to keep them in games or have had those that have been called upon to replace the slew of injured veterans played the kind of hockey to win games. Rookie goaltending sensation Chad Johnson, who, in addition to assuming the Pack starting job over incumbents Matt Zaba and Miika Wiikman, also won his first NHL game of his career stopping 34 of 35 shots against the Colorado Avalanche in a 3-1 win on January 31st, was simply awful in allowing seven goals to Providence Friday night. On Saturday it was Wiikman’s turn in net. Wiikman (2-3-0) was given his first start for the Wolf Pack since getting pulled against the Hershey Bears on October 30th after allowing four goals on thirteen shots in 23:35 of ice time. The Finnish netminder was then sent to Charlotte as the odd man out for the work in Hartford. While playing for the Checkers, Wiikman rediscovered the game that led to his unseating Al Montoya as the Pack starter two seasons ago. The 5’11, 187 pounder amassed a 9-2-3 record with a 2.77GAA and a .909% in sixteen games. General Manager and Head Coach Derek Wilkinson has done nothing but offer effusive praise for his goaltender over multiple conversations. Since arriving back from Charlotte after Steve Valiquette injured his hand in practice, exactly three months after being sent there, Wiikman has spent the last two weeks on the bench. It sounds like a list of excuses for the Finnish netminder’s less than stellar performance in surrendering six goals in the loss to the Sound Tigers, but to pin this loss solely on his shoulders would be completely unfair. However, the Mariestad, Sweden native was not good and clearly struggled in stopping only 27 of 33 shots. “I thought we gave a pretty good effort and worked hard to get our goals, but it’s a pretty fine line between winning and losing and we can’t keep making mistakes,” Gernander said. The Pack fell behind just19 seconds into the contest when ex-Pack captain Greg Moore intercepted a telegraphed, defensive-zone cross-ice pass from Jared Nightingale to Illka Heikkinen. Moore charged up the slot and fired a wrister into the upper corner of the net over Wiikman’s blocker. Byers, the current Pack captain, answered for his teammates at 7:42 when he threw the puck from the left corner at the net and it hit the skate of Sound Tiger defenseman Brett Westgarth and under the pads of Scott Munroe (24 saves, 12-11-3). But the tie was short lived as the Tigers came back and tallied again at 16:52, just five seconds after Andrew Carroll took an interference call leaving the Pack shorthanded for the second time in the period. Trevor Smith won a faceoff with Brodie Dupont and back to Greg Mauldin at the left point. The shot rebounded in front and Smith slid the puck from the left side of the crease to the right where Ryan Kinasewich, just up from the Utah Grizzlies of the ECHL, put it under the glove of the diving Wiikman. The period ended with the Pack licking their wounds and having been out shot 15-5 by the visitors. It didn’t take long for the Pack to get the equalizer for a second time. At 3:57 with the Pack in a four-on-three man advantage, there was a scramble in front of the Bridgeport net. Byers, who has really elevated his play, slid the puck over to the right side where the AHL’s third leading scorer, Corey Locke was waiting. Locke then lifted the puck over the glove of the Tigers’ cage guard. 57 seconds later the Pack had their first and only lead of the contest when they tallied on a great play four-on-four by Locke and Dale Weise. Sean Bentivoglio advanced the puck into the Pack zone on the right wing side. The Tiger’s left winger then attempted to fed NHL veteran Brendan Witt at the point. Weise jumped the pass and knocked it away. He then beat Bentivoglio to the puck and fed it to Locke on the right side. The play became a two-on-one against Witt. Locke fed Weise just after Witt went to the ice and Weise ended an eight game draught with a laser shot past Munroe for his 16th of the season. Mauldin, who’s five point game (goal and four helpers) tied the Sound Tigers’ single-game point record shared by current New York Islanders Blake Comeau and Jeff Tambellini, knotted the score for the third time when his shot from the left side somehow found it’s way under Wiikman. While playing four aside, 10:15 seconds later, Bridgeport took the lead for the third time. Mark Wotten put a backhander past the Hartford netminder after Mauldin’s shot that hit the back wall, careened off the side of the Pack net and bounced into the slot past Wiikman. It was Wotten’s third of the season. Byers scored his second goal of the game and knotted the score for the fourth time at 7:29 of the final frame. With Weise screening Munroe in front, Brodie Dupont took a Nigel Williams feed on the left side, walked in a bit and faked a shot on net. Dupont then fed Byers in the slot and the Pack captain redirected the puck into the corner pocket for his 16th of the season. But Bridgeport was able to ice the game when they scored two goals in 1:12. Evgeny Grachev had an excellent scoring chance and coming back the other way, Kinasewich made a spectacular cross ice pass through traffic that found Mauldin open in a two-on-=two rush up the ice. Nightingale was a little flatfooted and screened his own goaltender as Mauldin fired a shot that beat Wiikman over the blocker for what would prove to be the game winner. 48 seconds later, Locke went to the box on a hooking call for the Pack’s sixth penalty kill situation of the game. Bridgeport capitalized 24 seconds later for their third power play goal of the game when Mark Flood’s seeing eye slapshot from just inside the blue line made it’s way through a seas of people and into the back of the Pack net. “I thought coming off (Friday) night that the effort was a lot better all over ice, but we still lost the game,” Byers said. “For whatever reason, both teams capitalized on each other’s mistakes, and they were able to capitalize two more times than we capitalized on theirs. It’s a home game so readers get the gift of Bruce Berlet back on the beat. Enjoy his literary prowess at Hartfordwolfpack.com. Games between the Pack and Tigers are always great because two great writers work the game. Bask in the work of Mike Fornabaio at CTPost.com. * If you have yet to sign up for our new service to our readers on Twitter, you’re really missing out on the most extensive coverage of the Wolf Pack and Checkers you’ll find anywhere. In addition to keeping you posted here on all major news stories, visit www.twitter.com/howlingstoday for in-game coverage of both Wolf Pack and Checkers games. Please “Follow” us on Twitter. * Pack have not scored two power play goals in a game in six games. The last came on January 27th in Norfolk against the Admirals in a 5-4 Pack loss. * Thirteen goals in two consecutive losses is the most the Pack have surrendered since allowing fourteen goals in losses to Hershey (9-2) and Portland (5-2) back on December 6th and 11th respectively. * The Pack are 4-5-0-0 in games decided by two goals and 9-12-2-2 in games where they are outshot by their opponents. * Brodie Dupont has two assists in the last two games. Dale Weise ended an eight game pointless streak with two points (1g, 1a) as did Kevin Schaeffer with his helper on Byers first goal. * Evgeny Grachev has had one point (a goal against Providence Friday) in his last ten games. Paul Crowder is pointless in his last seven. * Bruce Garrioch of the Ottawa Sun is reporting that the NY Rangers are shopping former Wolf Pack center, Brandon Dubinsky. If Glen Sather and his management team were really smart the move they should make would be to hold on to Dubinsky and trade John Tortorella. That move alone would probably ignite the barn and get the horses running. The NY Post’s Larry Brooks has an excellent column on the issue regarding his treatment of rookie Michael Del Zotto. Pack are off to play the white-hot Portland Pirates who’ve won eight straight and nine of ten for a Monday afternoon tilt at 1pm. Bob Crawford is on the air with the pre-game show at 12:30. If you can attend the cost is as little as $10 a ticket, why not just go? For Ticket information call (860) 548-2000. Too far away or can’t make it? Listen live at WTIC.com. 1st Period-1, Bridgeport, Moore 13 0:19. 2, Hartford, Byers 15 (Schaeffer, Urquhart), 7:42. 3, Bridgeport, Kinasewich 1 (Smith, Mauldin), 16:52 (pp). Penalties-Figren Bri (goaltender interference), 1:59; Brashear Hfd (boarding), 8:07; Mauldin Bri (tripping), 12:06; Carroll Hfd (interference), 16:47. 2nd Period-4, Hartford, Locke 21 (Byers, Weise), 3:57 (pp). 5, Hartford, Weise 16 (Locke), 4:54. 6, Bridgeport, Kinasewich 2 (Mauldin, Flood), 6:10 (pp). 7, Bridgeport, Wotton 3 (Mauldin, Flood), 16:25. Penalties-Morency Bri (roughing), 3:21; DiDiomete Hfd (roughing), 3:21; Witt Bri (hooking), 3:26; Dupont Hfd (hooking), 5:43; Gillies Bri (tripping), 8:55; Couture Hfd (high-sticking), 9:42; Weise Hfd (high-sticking), 14:05; Bentivoglio Bri (diving), 16:09; Williams Hfd (hooking), 16:09. 3rd Period-8, Hartford, Byers 16 (Dupont, Williams), 7:29 (pp). 9, Bridgeport, Mauldin 18 (Kinasewich), 13:28. 10, Bridgeport, Flood 7 (Smith, Mauldin), 14:40 (pp). Penalties-Kinasewich Bri (hooking), 6:27; Locke Hfd (holding), 14:16. Shots on Goal-Bridgeport 15-11-7-33. Hartford 5-10-13-28. Power Play Opportunities-Bridgeport 3 of 6; Hartford 2 of 5. Goalies-Bridgeport, Munroe 12-11-3 (28 shots-24 saves). Hartford, Wiikman 2-3-0 (33 shots-27 saves). The Charlotte Checkers fell behind by two goals in the first period and could not bounce back as they were edged 2-1 by the Gwinnett Gladiators on Saturday evening. The Checkers outshot Gwinnett 36-15 but Gladiators netminder David Brown stopped all but one en route to his fourth win in eight tries against Charlotte. Charlotte now has a 7-4-2 record in 13 games against their division rival. Coming into the game, the Checkers were on a four-game win streak and had picked up a point in six straight games (5-0-1). Gwinnett held the ninth spot in the American Conference and were five points away from the eighth and final playoff spot. Just a minute and a half in, the Gladiators opened the scoring on the game’s first shot. Defenseman Chad Denny forced a turnover down low in the Checkers end and wrapped the puck around and in past Charlotte goaltender Ryan Munce for the early 1-0 lead. With less than seven minutes to play in the period, Gwinnett went to work on the power play and doubled their lead. Phil Youngclaus sent a pass from the right corner to an open Tim Miller in the slot. Miller made no mistake, blasting the puck into the empty cage for his 10th of the year. Charlotte carried the play in the second period, however Brown continued to dominate, stopping 16 shots to maintain the two-goal lead. The Checkers had three opportunities with the man advantage but were unable to get on the board. Charlotte held a 24-10 shot advantage through 40 minutes of play but a 2-0 disadvantage on the scoreboard. The third period was no different as the Checkers outshot and outplayed Gwinnett but were unable to get one past Brown until the final minute when Daniel Tkaczuk broke the shutout attempt. Tkaczuk grabbed the rebound from a David Marshall shot and lifted it over the stacked pads of Brown for his ninth of the season. The goal came with seven seconds to play in the game and the Checkers were unable to complete the comeback. The Gladiators mustered a season-low 15 shots on net but Brown was the difference and they walked away with the 2-1 victory. The Checkers (28-16-6) will host the Toledo Walleye on Thursday for the ‘Midnight Game’. Puck drops at 11:59 p.m. and ticket information can be obtained by calling 704-342-4-ICE or visiting www.gocheckers.com. One thing that has made the Charlotte Checkers so successful is their willingness to try new things and have exciting promotions. At 11:59pm on Thursday night, the puck will drop with the Toledo Walleye. Howlings will be covering the contest and it should be quite interesting to see how many Checkers fans show up for that one. We’re hoping there’s a lot so that teams will try more things like this in the future and think outside of the box. You’ll find in live in-game coverage at www.twitter.com/howlingstoday. 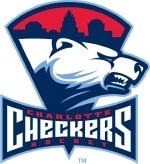 You can always buy tickets for any Checkers game home or away at Ticketmaster.com. Should you want to watch this very exciting team from the comfort of your computer chair, all Checkers games are available on B2Live. 1st Period-1, Gwinnett, Denny 7 1:31. 2, Gwinnett, Miller 10 (Youngclaus), 13:51 (pp). Penalties-Reynolds Chr (fighting – major), 3:37; Miller Gwt (fighting – major), 3:37; Paris Gwt (tripping), 4:06; Leveille Chr (interference), 12:52. 2nd Period- No Scoring.Penalties-Crane Chr (slashing ), 0:39; Stefanishion Chr (roughing), 3:43; Forney Gwt (high-sticking), 3:43; Miller Gwt (hooking), 6:22; Denny Gwt (slashing ), 9:39; Stefanishion Chr (interference on the goalkeeper), 12:05; Francis Gwt (high-sticking), 19:01. 3rd Period-3, Charlotte, Tkaczuk 9 (Marshall, Slattengren), 0:07. Penalties-Chabot Chr (tripping), 10:30; Hurley Gwt (roughing), 15:09. Shots on Goal-Charlotte 8-16-12-36. Gwinnett 4-6-5-15. Power Play Opportunities-Charlotte 0 of 5; Gwinnett 1 of 4. Goalies-Charlotte, Munce 13-10-1-1 (15 shots-13 saves). 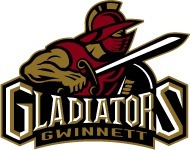 Gwinnett, Brown 7-10-2-0 (36 shots-35 saves). The Packs first came as Andres Ambϋhl, who has greatly improved his game of late, gave the Pack a 1-0 lead with a tally at 9:17 of the first period. Following up his own shot that Bridgeport netminder Scott Munroe (29 saves, 7-5-1) had denied, Devin DiDiomete retrieved the puck in the corner and made a smashingly great feed to Ambϋhl just inside the slot on the left side. The assist was the first point for DiDiomete in his fourth AHL game since returning from a broken arm sustained in training camp. The Pack controlled the play in the first period outshooting the Tigers 13-7. The Tigers best scoring chance of the period came at 14:37. On a break in play, Trevor Smith got ahead of Brodie Dupont going up the slot. 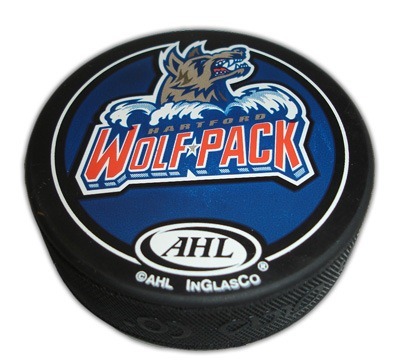 Ex-Pack captain, Greg Moore feathered a beautiful lead pass through traffic and Matt Zaba, (39 saves, 1-1-1) making his first start in five games (Nov 19th vs. Wilkes-Barre) made a great play to repel the attack and the Wolf Pack led 1-0 at the first intermission. Realizing that fatigue could play a factor later, and it did, the Pack came out of the gates to start the second period looking to build on their lead against their hosts. At 1:41, Michael Sauer picked up his first point in seven games when his shot from the right point hit Paul Crowder in front of the net and got past Munroe. Crowder has goals in back-to-back games and four in his last six contests. But with the two goal lead, Bridgeport raised the level of their play and pressed their visitors hard with good scoring chances. “We’re pretty fortunate that Zabs has fresh legs and made some big saves. I thought he played very well.” Gernander said. Despite the yeoman effort between the pipes there was nothing he could do on the Sound Tigers first tally. James Sixsmith’s harassment of ECHL call-up Jared Nightingale led to a turnover behind the Pack net. Once with the puck, Sixsmith looked up to find left wing Trevor Smith had beaten Derek Couture and Ryan Garlock coming back up the slot and fed his teammate with a perfect pass that Smith put high over Zaba at 13:38. The two teams came out of the second intermission and the Pack clearly looked tired. The Tigers had control of the puck in the Pack zone for what seemed like forever. The Tigers were able to make a full line change without leaving the Pack zone. When Brodie Dupont finally got control of the puck it seemed like they would be able to make a change, but he whiffed slightly on his clearing attempt and Smith picked it up and fed Dustin Kohn. The Tigers defenseman carried the puck around the Pack zone like Marques Haynes of the Harlem Globetrotters dribbling through the Washington Generals. Dupont did his best to try and rid the Edmonton native of the puck but he just didn’t have the legs to keep up. Kohn found Andy MacDonald, just back in the AHL from an NHL recall with the Islanders, and blasted a shot from the right point and beat Zaba to the glove side for his second of the season at 1:24. The game stayed tied through the rest of the period and through overtime as both teams were tired, but clearly the Pack’s legs were gone. “I thought there were times tonight where we could have shot the puck more, not necessarily always to score but to rather than to force a play into coverage, to put it at the net and to hopefully get a rebound opportunity or something like that just to create more pressure.” Gernander said. In the shootout, the Pack sent out Dale Weise who’s backhanded shot was denied by Munroe. Zaba then stopped Smith with a try for the five-hole. Dane Byers was up next for the Pack, but his try went for naught. Then Moore had a chance to do some damage to his ex-mates and did when he came up the ice slowly and then wristed a hard shot from the left side over Zaba’s shoulder for the 1-0 lead. Paul Crowder was dispensed by Munroe before Greg Mauldin’s shot was as close as you can get without scoring as his high shot rang of the crossbar behind Zaba. The Pack needed a score and the AHL’s leader in that department didn’t fail them as Corey Locke’s fake got Munroe down and then the Toronto native lifted it over him off the backhand. Justin DiBenedetto then rang his shot off the crossbar also and the Pack had a chance to give themselves the lead. But Munroe stopped Ambϋhl with an impressive dive back to the puck that robbed the young German of a score. When Zaba stopped MacDonald’s backhanded bid the shootout would head to extra rounds. Jordan Owens had the Pack’s first stab at it and put the puck right in the center of Munroe’s chest. That left it to Matt Martin with a chance to win it for the home team. Martin came in with speed and moved the puck and then blasted a wrister from in tight low to the blocker side beating Zaba for the win. Bob Crawford one again has all the bases covered, not just with great announcing but with a solid look at the game at Hartfordwolfpack.com. Mike Fornabaio brilliantly covers the game from the Bridgeport perspective in The Connecticut Post for the view from inside the Bridgeport locker room. * Scouts aplenty were in the building for this one. From the Rangers, AGM & Wolf PAck GM, Jim Schoenfeld, Adam Graves, Anders Hedberg were all in the press box. Scouts from the Columbus Blue Jackets were in teh building as was John Ferguson with the San Jose Sharks. * Conversely the Penalty Killing just keeps getting stronger moving up now to 17th at 82.3% Hershey is still tops at 94.7%. * Despite not playing particularly well the past 4 games, the Pack did manage to pick up six points. * When outshot by their opponent, the team record is 7-2-0-2 and 4-4-1-2 in one goal games. * At home the Pack are 8-1-1-1 and on the road 5-7-0-1. * Michael Sauer ended a six game pointless streak with an assist on the Crowder goal in the second period. * Andres Ambϋhl is playing exceptionally well and now has 2 goals in his last three games. * Grachev has just 1 goal total to show for his last five games and has gone blank the last three. * Weise was kept off the scorer’s sheet for the first time in six games. The Charlotte Checkers fell behind by two goals in the third period and battled back with a dramatic 5-4 overtime victory over the Gwinnett Gladiators on Sunday afternoon. With the win, the Checkers have now won six straight games at Time Warner Cable Arena. Tyler Doig registered a “Gordie Howe hat trick” – two goals, an assist and a fighting major – and scored the game-winning goal on a penalty shot in overtime. Charlotte played short-handed with only four defensemen after team captain Jared Nightingale and rookie blueliner Mike Berube were called up to Hartford prior to the game. Gwinnett drew first blood just over four minutes into the game on a goal by winger Pat Galivan. Gladiators leading scorer Tom Zanoski fed Galivan in the slot who then backhanded a shot past Munce for his ninth of the season. The Checkers would respond back early in the second period on the power play. Tyler Doig took a pass from Michel Leveille at the point and let go a wrist shot through traffic that beat Gladiators goaltender David Brown. The goal came at the 3:38 mark of the period. Just one minute and four seconds later, Gwinnett regained the lead on a Checkers turnover in the defensive end. Matt Francis grabbed the puck, took a shot on net and Chad Denny was there to stuff home the rebound. Charlotte kept coming, however, and tied the game with 32 seconds to play in the second period. Defenseman Chris Snavely took a pass from Jean-Philipp Chabot in the slot and beat Brown with a wrist shot for his first of the season. In the third period, Gwinnett put their league-leading power play to work and regained the lead on a goal by Matt Siddall. The Gladiators then added another by leading scorer Tom Zanoski to bring the score to 4-2. The Checkers would not give up and scored a power-play goal with less than five minutes to play to bring them to within one. Randy Rowe took the puck in the slot and fired a shot under the cross-bar for his third in as many games since returning from injury. With time winding down, Charlotte pulled their goaltender for the extra attacker and it paid off as David Marshall scored the tying goal with 12 seconds to play. In overtime, T.J. Reynolds made a beautiful pass to Doig who skated in alone on the Gwinnett goaltender but was hauled down. Doig was awarded a penalty shot and made good use of it as he faked a slap shot, fooling the netminder, and tucked it home for the victory. Notes: The Checkers have won six straight games at home…Charlotte has scored 41 goals in its last seven games (5.85 goals per game)…Tyler Doig has 16 points (4g, 12a) in his last nine games…Kenny Roche has seven goals in his last seven games…Randy Rowe has seven points (3g, 4a) in three games since beginning the season on injured reserve…Michel Leveille leads the team in scoring with 25 pts (10g, 15a) in 17 games…T.J. Reynolds leads all ECHL defensemen with 72 penalty minutes and eight fighting majors… Matt Ford remains with Lake Erie (AHL) and defenseman Ethan Graham is with Norfolk (AHL)…Trevor Glass remains on the 21-day injured reserve. 1st Period-1, Gwinnett, Galivan 9 (Zanoski, Forney), 4:41. Penalties-Reynolds Chr (cross-checking), 2:22; Fritsch Gwt (hooking), 7:39; Zanoski Gwt (interference), 10:28. 2nd Period-2, Charlotte, Doig 5 (Leveille), 3:38. 3, Gwinnett, Denny 2 (Francis, Siddall), 4:42. 4, Charlotte, Snavely 1 (Chabot, Doig), 19:28. Penalties-Siddall Gwt (slashing ), 1:36; Brocklehurst Gwt (hooking), 6:26. 3rd Period-5, Gwinnett, Siddall 5 (Denny, Francis), 4:02 (pp). 6, Gwinnett, Zanoski 12 (Lawrence), 9:30. 7, Charlotte, Rowe 3 (Leveille, Ward), 15:14 (pp). 8, Charlotte, Marshall 3 (Rowe, Roche), 19:48. Penalties-Marshall Chr (slashing ), 1:32; Snavely Chr (delay of game), 2:15; Galivan Gwt (slashing ), 4:20; Lawrence Gwt (holding), 5:04; Leveille Chr (holding the stick), 5:04; Denny Gwt (slashing ), 6:51; Galivan Gwt (fighting – major), 10:51; Doig Chr (slashing , instigating, fighting – major), 10:51; Marchesi Gwt (holding), 13:10; Filangieri Gwt (high-sticking, unsportsmanlike conduct), 13:19. Shots on Goal-Gwinnett 12-7-11-3-33. Charlotte 9-13-22-6-50. Power Play Opportunities-Gwinnett 1 of 5; Charlotte 1 of 9. Goalies-Gwinnett, Brown 1-1-1-0 (50 shots-45 saves). Charlotte, Munce 2-1-0-0 (33 shots-29 saves). After playing four in five nights, including three overtimes and still walking off with 6 points, the Pack get Monday off and then back to the practice ice on Tuesday as they get ready for another three in three starting Friday night against first place Manchester in the battle of the AEG controlled teams. Then they hit the road for two in Pennsylvania …Saturday in Wilkes-Barre and Sunday in Hershey. Howlings will there for both games in both cities as Saturday is my birthday and seeing these two games in person was what I wanted to do. So getting you the info you need to stay current on the team is my gift to you as I officially become older than dirt. 1st Period-1, Hartford, Ambuhl 3 (DiDiomete), 9:17. Penalties-Byers Hfd (fighting), 9:19; Martin Bri (fighting), 9:19. 2nd Period-2, Hartford, Crowder 6 (Sauer, Urquhart), 1:41. 3, Bridgeport, Smith 8 (Sixsmith, Marcinko), 13:38. Penalties-Owens Hfd (boarding), 1:48; Garlock Hfd (roughing), 10:30; Heikkinen Hfd (roughing), 10:30; Bentivoglio Bri (roughing), 10:30; Nightingale Hfd (cross-checking), 16:33; DiBenedetto Bri (roughing), 16:33. 3rd Period-4, Bridgeport, MacDonald 2 (Kohn, Smith), 1:24. Penalties-Nightingale Hfd (roughing), 9:13; Klementyev Bri (roughing), 9:13; Urquhart Hfd (tripping), 10:21; Smith Bri (tripping), 11:47. Shootout – Hartford 1 (Weise NG, Byers NG, Crowder NG, Locke G, Ambuhl NG, Owens NG), Bridgeport 2 (Smith NG, Moore G, Mauldin NG, DiBenedetto NG, MacDonald NG, Martin G). Shots on Goal-Hartford 7-13-7-4-0-31. Bridgeport 13-13-11-4-1-42. Power Play Opportunities-Hartford 0 of 1; Bridgeport 0 of 3. Goalies-Hartford, Zaba 1-1-1 (41 shots-39 saves). Bridgeport, Munroe 7-5-1 (31 shots-29 saves).